"HIGHEST RETURN ON EQUITY OVER THREE YEARS / HIGHEST GROWTH IN PROFIT AFTER TAX OVER THREE YEARS: CONSTRUCTION: Muhibbah Engineering (M) Bhd - A Steady Growth Story | The Edge Billion Ringgit Club 2018"
Low-key Muhibbah Engineering (M) Bhd has done business in Thailand, Australia, Yemen, Cambodia, Qatar and Singapore, just to name a few of the countries it has secured jobs in. This geographical spread could be due to its diverse businesses, which include engineering and construction, crane manufacturing, shipbuilding, repair and conversion, onshore and offshore fabrication, oil and gas and manufacturing of aviation support. The notable jobs Muhibbah has undertaken include the building of three of Cambodia’s airports, in Phnom Penh, Siem Reap and Sihanoukville on a build-operate-transfer concession; the South Klang Valley Expressway in Selangor; petrochemical jetties and related works for a bulk liquid product terminal at Jurong Island, Singapore; the Ministry of Transport headquarters in Putrajaya; and the Wiggins Island Coal Export Terminal GC12, offshore marine works, jetty and ship berth in Queensland, Australia. The company is one of six licensed fabricators for Petroliam Nasional Bhd. Muhibbah also has 59.28% equity interest in crane manufacturer Favelle Favco Bhd, which was listed on the Kuala Lumpur Stock Exchange in 2006, and, in turn, owns Kroll Cranes A/S of Denmark. Muhibbah’s crane division has been involved in the construction of 8 out of 10 of the world’s tallest buildings. Just as impressive are the company’s financials. Over the past few years Muhibbah has managed good growth — chalking up a profit of RM131.61 million in 2017, from RM105.5 million in 2016; RM87.5 million in 2015; and RM81.6 million in 2014. That translates into a three-year compound annual growth rate of 17.3% — the highest of The Edge-BRC members in the construction sector. Muhibbah’s three-year weighted return on equity was also the best among its peers over the award evaluation period. In line with the good showing, the company’s dividend payments have gained from 5 sen or RM24 million in FY2015, to 5.5 sen or RM26.4 million in FY2016, and up 27% to 7 sen or RM33.6 million in FY2017. The current year has started off well for Muhibbah, with the company raking in 12% more profit year on year to RM106.92 million for the nine months ended September, on the back of 3.4% y-o-y growth in revenue to RM1.12 billion. As at end-September, Muhibbah had cash and cash equivalents of RM582.3 million while on the other side of the balance sheet, it had RM338 million in long-term borrowings and RM80 million in short-term debt commitments. Net asset attributable to owners was RM2.33 per share. 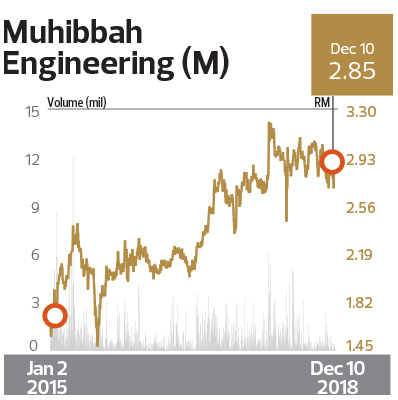 Muhibbah’s outstanding order book stood at RM1.8 billion as at Nov 28, the bulk coming from infrastructure and construction and the rest from its crane division. The composition of its order book remains predominantly domestic, but a meaningful 38% comes from overseas jobs. The foreign jobs insulate Muhibbah from any uncertainty on the local front, with the government slashing expenditure and cutting costs. The company’s Cambodian airport concessions and overseas contracts in Qatar stand it in good stead to weather any uncertainty if there is a slowdown in domestic contracts. While many companies have suffered from the deferment or cancellation of rail projects, such as the Kuala Lumpur-Singapore high-speed rail project and the East Coast Rail Link, Muhibbah seems to be insulated. The company’s only exposure to rail construction is via noise barrier contracts it secured for LRT3 and MRT2 totalling RM276 million, which are unlikely to be impacted as noise barrier packages are only a minor component of the total cost of urban rail contracts. Analysts are overwhelmingly positive on Muhibbah’s prospects, with six having a “buy” recommendation and one “hold”, with target prices ranging from RM3.06 to RM4.37 apiece, according to Bloomberg data. The 12-month consensus target price is RM3.77, implying a 33.7% upside potential from Dec 7’s close of RM2.82. Muhibbah’s largest shareholder is Mac Ngan Boon @ Mac Yin Boon, with 19.45% equity interest. The only other substantial shareholder is pilgrim fund Lembaga Tabung Haji with a 9.33% stake.